Bahut Bada Hai Tu. Bahut Akad Hai Tohra Mein. Dekh Kaise Ukadte Hain Akad Teri. There couldn't be a better tribute to Dashrath Manjhi and showcasing the saga of his unflinching arduous mammoth dream. Though, it is sad that it took so long for his "madness" to get recognized. 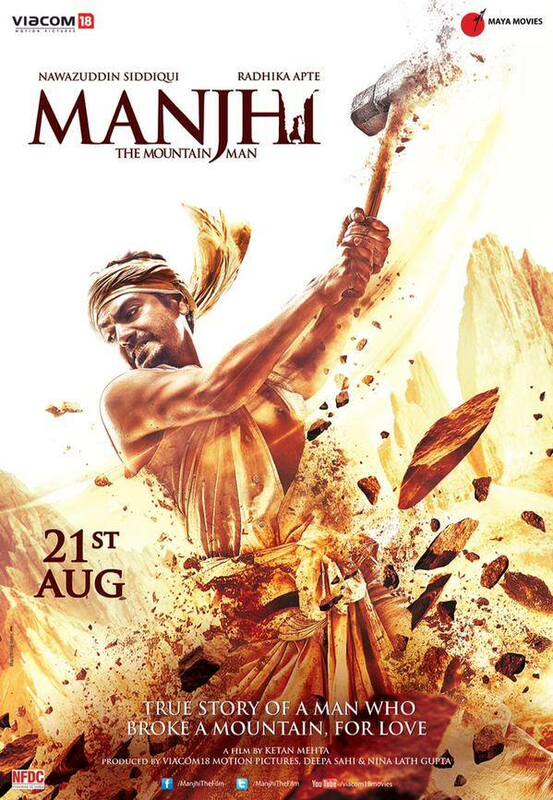 I can bet that if people didn't know about Manjhi, no one would have even dared to pen a fictional script like this. Phaguniya..Phaguniya.. Once again you have bowled me over yaar. Radhika Apte How effortlessly you can transition from a practical modern women in Hunterr to a seductress in Ahalya to a village damsel in Manjhi. Critics might call me insane, but I wouldn't resist from comparing her with legend Shabana Azmi. Today in Bollywood, Radhika Apte defines versatility and quality cinema. Please don't get lured by 100Cr Club and Karan Johars of the world. Earnest Request! Directors beware, old tiger is back on the prowl. In 2014, Rang Rasiya and in 2015 Manjhi- The Mountain Man. You totally rock Ketan Mehta. Welcome back to the pitch. We totally missed you in last 10 years since Mangal Pandey: The Rising in 2005. This film could have easily veered into the territory of boring documentaries. It requires the vision and expertise of an able director like Ketan to tell that compelling story infused with emotions and laced with the petals of romance. Due to absence of Khans, this movie won't touch any impressive financial figures but it'll be cherished forever in imdb lists of quality and meaningful cinema. 3) "Apna newspaper chalu karna asaan kaam nahi hai." "Pahad tode bhi jaada muskil hai ka!" 4) Bhagwan ke bharose mat baithiye, ka pata oo hamare bharose baitha ho!